The Ford Super Duty F-250 pickup truck tows, rides like a luxury sedan, and handles off-road challenges with relative ease. Here it is seen in a pre-rodeo photo taken at Sports Authority Field in Colorado. Excuse me, Ford dealers, but I have to tell everyone in the Super Duty market to hold off on buying one for a month or so. You see, I just drove the new 2017 Ford F-250 and was so impressed I’m actually writing about the experience in the American Airlines Admirals Club lounge at the Denver Airport while I wait for an (always delayed) plane ride home. 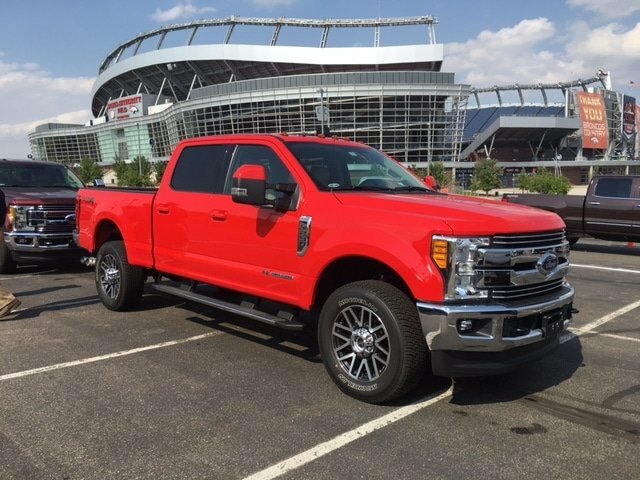 I drove the 2017 Ford Super Duty on the highway, navigated a slalom course, through an off-road area in the Colorado mountains, and maneuvered along city streets. Super Duty? Well, it drove more like a Taurus sedan. I was totally amazed at the smoothness. The agility. The handling. My, how far trucks have come in recent years. My first day at the event was spent driving Ram trucks, General Motors trucks and Ford trucks through a slalom course. None of the trucks were disappointing (good news for truck-driving Americans) but, I must advise everyone to definitely get adaptive steering control on any truck you acquire. At low speeds, adaptive steering reduces the amount of steering input needed to change direction and provide more agility. At highway speeds, it reduces vehicle sensitivity to steering input to make cornering much safer and more secure. The steering ratio constantly changes depending on vehicle speed and road conditions. The difference in having it engaged when cornering and not having it engaged is night and day – or should I say life and death! For someone like myself who likes to accelerate through every curve to enhance the joy of driving, this is an absolute must. The Ford Super Duty is the first heavy duty vehicle to offer adaptive steering. Cameras. Cameras! Cameras!! They not only make life so much easier, but safer as well. Depending on the model one chooses, up to seven cameras are available on board 2017 Ford Super Duty trucks. A front camera provides a 180-degree view that can get one out of all types of spots. For instance, while I was on the off-road course during my second day of the launch event, there was a giant rock directly in front of me. I would have to make a hard left in order to avoid it. At the same time, there were other obstacles to my left making the turn perilous in many ways. I engaged the camera and the exact view of the rock, of the sides of my truck and of the obstacles were all plainly visible. Getting through the mess was no problem at all. I am approaching a large rock. 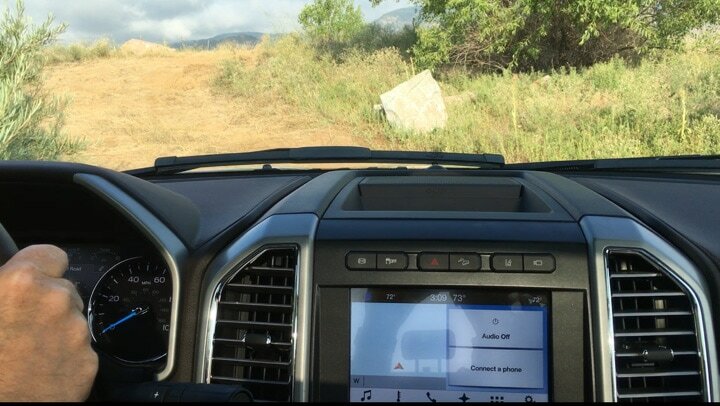 The camera in my 2017 Super Duty F-250 will guide me up to the rock, showing me when I am right next to it. It will then show me when to make a sharp left turn to avoid obstacles on the left side of the truck. I emerged from this situation without even a scratch on the side. During my off-road travels I also encountered a mud-pit. 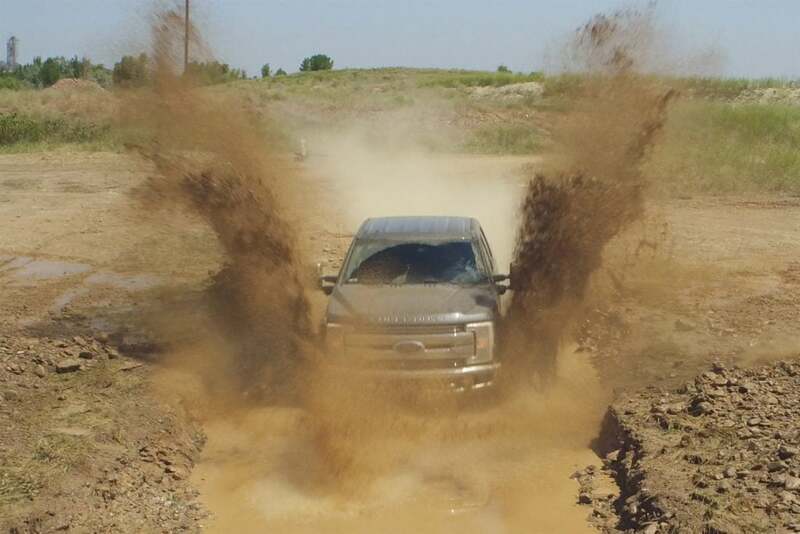 I sent mud flying in every dirction, including on, around, and under the truck. Does it kill my front end camera or slow me down? No! A camera washer system is integrated into the truck, and activates every time one engages the windshield washer. The front end camera and two side view cameras will guide the driver with complete views along both sides of the truck. The side camera views can be combined with the front camera to provide a 360 degree view of the entire vicinity. A Center High-Mounted Stop Light (CHMSL) camera lets the driver see the entire cargo bed to insure that nothing has moved or provide assurance there is no problem in the bed. If one has a fifth-wheel installed, it is a perfect aid in hooking up trailers to the gooseneck. A tailgate camera provides the same level of ease and security when one is backing up to hook up a traditional trailer. As one shifts into reverse, guidelines show exactly where one will end up when they continue on the current course and a zoom gives a close-up view of the hitch and the trailer so being exact is child’s-play. If ordered, the factory will also provide another trailer camera which will provide a view behind the trailer. It is waterproof and submersible for backing boats into the water and the customer can place it where it provides the optimum view for their needs. Work related advantages in the new 2017 Ford Super Duty don’t stop there. Now, the driver can release the tailgate remotely from the cab with the push of a button. Most are familiar with the tailgate step, which is a fantastic help for those of us shorter than six-foot-five! The retractable step has been redesigned and is now further improved with the step and handle fully integrated inside the tailgate. Side steps in the 2017 F-250 heavy duty have replaced with something even better. Deployable running boards now run slightly behind the cab to aid in truck bed access as well as to enter and exit the cab. The interior is world-class with space for much of your office inside. The center console has room for a laptop and even hanging file folders inside as well as new storage pockets on each side for items which you want quickly at hand. There is even space for four drinks with sliding cupholders. 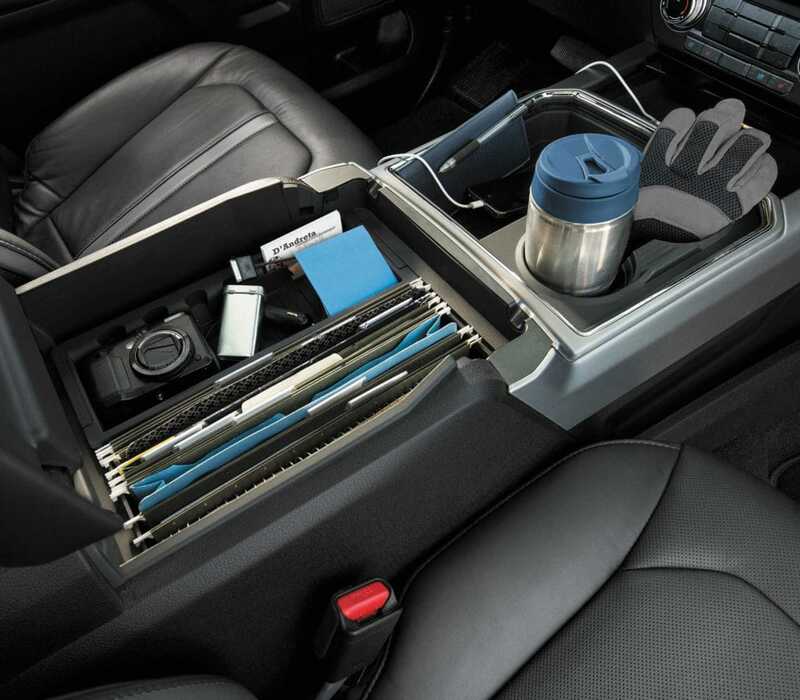 The glovebox is larger than ever before with two spaces for important papers and other items. As recently as a couple weeks ago, I was hauling some cargo in the back of my own personal Ford F-150. I admit I had a rough time tying down the large and bulky articles in the truck bed. The 2017 Ford Super Duty has “BoxLink with premium locking cleats,” Ford’s system which provides added tie-downs and plates which are compatible with industry-standard E-track accessories. How many times have you wanted to load a motorcycle or four-wheeler into your truck? It’s a snap with the built-in loading ramps which can be attached to the tailgate when you need to use them and slid back under the bed when you aren’t. My experience was behind the wheel of the 2017 F-250 Super Duty Platinum. The interior rivaled that of any luxury car I have ever been in. Comfort is exceptional, and the ride is smooth under all conditions. My recommendation to anyone shopping for a new Super Duty is to watch availability at your local Ford dealer and test drive it as soon as possible. They should be arriving on dealer lots by September.